The James Bond 007 Fragrance, designed by Eon Productions in association with Procter & Gamble has been released in several collectible fragrances. The first edition, released in October 2012, in the black bottle, features notes of apple, cardamom, sandalwood, vetiver, lavender, moss and coumarin that will give you a retro feel. The 007 logo is embossed on the front of the bottle of the eau de toilette. The 'diamond shaped' pattern on the bottle and packaging looks similar to the pattern of the ST Dupont Diamond Head cufflinks worn by Bond in Casino Royale and Quantum of Solace. The 50 year golden anniversary of James Bond films in 2012 was marked with the introduction of a limited edition deluxe golden bottle of 75ml (£36). In November 2013, another Limited Edition was released, featuring a golden British flag on the box (see image on the left). In March 2013, a new fragrance called Ocean Royale (blue bottle) was released. Ocean Royale features lime, anise, bergamot, sea breeze accord, iris, teak, tonka bean, coffee, cedar, sandalwood and guaiac wood. It is available as 30, 50 and 75 ml and 125 ml Eau de Toilette with aftershave lotion, shower gel and two types of deodorants. 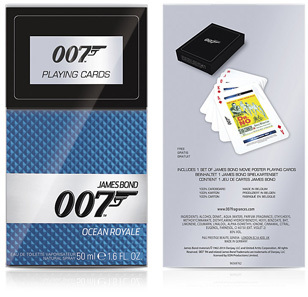 On 27 June 2014, Harrods launched a special edition of Ocean Royale (50ml) with a set of 007 playing cards, order now for the promotional price of only £16,75 (instead of £25; international shipping available). In August 2013, another eau de toilette series was released, called Quantum (silver bottle). Top notes: juniper berries and bergamot, heart notes: sandalwood and base notes: leather and violet leaf. 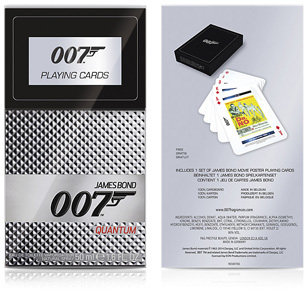 On 27 June 2014, Harrods launched a special edition of Quantum (50ml) with a set of 007 playing cards, order now for the promotional price of only £16,75 (instead of £25; international shipping available). 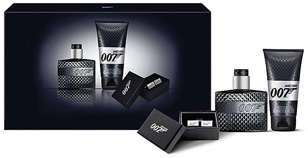 Amazon.com, Amazon.co.uk (UK) and Amazon.de in Germany offer the complete range of James Bond Fragrance, shower gel and deodorant. The Gift set, as pictured above, including cufflinks, shower gel and fragrance was available for a limited time at Harrods.com for only £25. 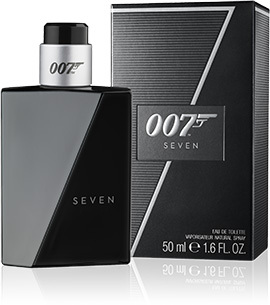 In 2015, the latest Men's Fragrance was released, 007 SEVEN, read more about that fragrance here. The print ad campaign, which features a silhouette of a man who could be a member of MI6, has been designed by Greg Williams, who has created the Bond on Set books and campaigns for five most recent James Bond films. This is not the first James Bond 007 branded fragrance. Other releases include JAMES BOND By A.B.R. Barlach, James Bond 007 “Tomorrow Never Dies” Parfum by Luca Bossi, and Avon created a Bond Girl 007 fragrance to be associated with the 2008 James Bond film Quantum of Solace. Spoke to Harrods they do not ship the the US! Where can we find this state side? Is this going to be offered in America? Yes, it will be available worldwide in September. Interesting, Harrod's website shows a charge of L25 to ship to the U.S. but when you call, they say the DO NOT ship to the U.S? So which is it? It will be available stateside as of 9/19 anyway, at a far cheaper price than shipping it from the U.K. Patience, people!! Has anybody figured out where in the US this is being sold? Looks like Harrods is going to maintain an "exclusive" for now but SOME of the product is showing up on E-Bay for those who simpy CANNOT wait. Maybe they want to time the release of the fragrance to the release of the movie in the U.S? I wonder . . . . . . . .
Just bought it at khols.com and was going to try to see if they have it in the store today. When is it available in Adelaide? I have the Quantum Silver 007 and also the Limited Edition 50th Anniversary Gold 007.